After a too-long absence we are finally able to get out into nature again. It’s early Saturday morning on 26 January 2013. We head out along Boyes Drive Muizenberg and park just beyond the Shark Spotter at Ou Kraal where our hike begins. It’s one of those glorious Cape Town summer mornings – clear blue sky, no wind. Beautiful. You just have to be outside on days like this. 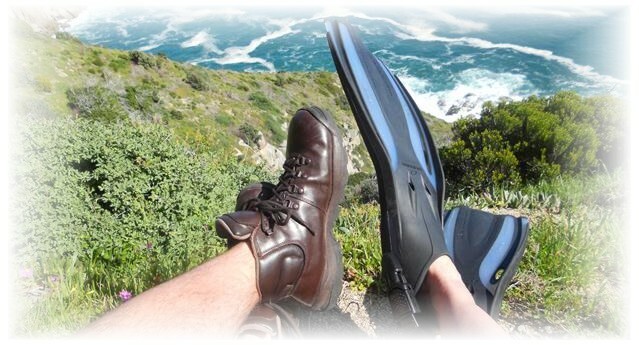 The trail takes the hiker gently up through the lovely fynbos with fabulous views over Kalk Bay. We had made an early start to beat the heat and there’s nothing like the cool breeze fanning the Cape fynbos on such a day. Before long (after about 1h15 of hiking) we reach the rock overhang where the traditional exit of Boomslang cave is situated. One tends to think that the people who venture out in the great outdoors are all like-minded bunny huggers who respect and protect nature. Sadly here is once again evidence that this is not the case. Crisp packets, beer bottle caps, empty colddrink bottles, even a dirty nappy litter the rock shelter. Not to mention the ubiquitous tissue paper festooning every shrub. And overhead and all around there is more than 80 years’ worth of graffiti with more apparently being added daily – S declared that he/she/it ‘hearts’ J only the day before our visit, in black marker on a handy rock. Who goes on a hike with a black marker or Tippex in their pack? Secretaries? Adventurous stationery reps? We stuck most of the rubbish we found into a backpack, but we drew the line at the nappy and would have needed a scrubbing brush to take care of the graffiti. (Mind you – the San also painted on cave walls centuries ago and most people agree that cave paintings are cool – will future generations feel the same way about S and J’s handiwork perhaps?). We had previously looked for the entrance to Boomslang Cave but were obviously looking in the wrong place. The usual entrance is clearly marked by –yes – graffiti. However, this time we find a way in, but we enter by what is traditionally the exit. This ‘wrong’ way round actually seems better to me, it’s gradually downhill all the way. (A Boomslang is a highly venomous but generally laid-back snake. The name translates to “Tree Snake” but in South Africa it is always called a Boomslang). You get down on your hands and knees right at the start and crawl forward for a few metres. Long trousers are recommended if you don’t want to skin your knees because there are some badly placed rocks on the floor. Soon you find you can shuffle along in a weird kind of crouched crabwalk, and then you can stand up straight. All the time there’s a reassuring breeze in the passage. Our torches light up fascinating crystals, lichens and cave formations (“speleothems” – remember that one for scrabble) ranging from large columns to tiny stalactites. The camera’s flash lights up even more amazing colour schemes than the torches. Occasionally a torch picks up a flitting bat. Bats get a lot of bad press but rabies notwithstanding they are actually fascinating creatures. And no, they don’t dive-bomb ladies with long hair. Before you know it, a shaft of light appears from on high – the way out. Very X-Filesey as can be seen in the photo above. A brief scramble and Clovelly lies below us. From here it’s about an hour’s walk back to the car. We had spent about 20 minutes in the cave. What a great hike to do in a morning! Now that we know where it is we will definitely be back to explore the cave in more detail.